VenturiVent Plus - Air Vent, Inc. The low-profile, shingle-over look of VenturiVent Plus creates a clean, uncluttered roofline. It installs on the peak of the roof allowing exhaust ventilation along the entire ridge -- end-to-end. With a 12" width, matching shingles can be installed over the vent, allowing the vent to appear almost invisible from the ground. Efficiently refreshing. That's out-of-site! Available with and without nails! The low-profile, shingle-over look of VenturiVent Plus creates a clean, uncluttered roofline. It installs on the peak of the roof, allowing exhaust ventilation along the entire ridge -- end-to-end. With a 12" width, matching shingles can be installed over the vent, allowing the vent to appear almost invisible from the ground. The low-profile, shingle-over look of VenturiVent Plus creates a clean, uncluttered roofline; and the vent performs better than other types of exhaust vents which are a lot more noticeable on the roof. Exceptional airflow. 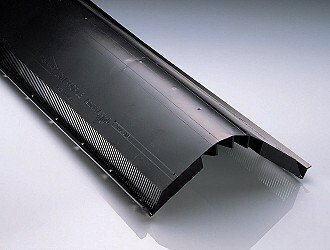 An external baffle creates low pressure over the vent openings to "pull" air from the attic. 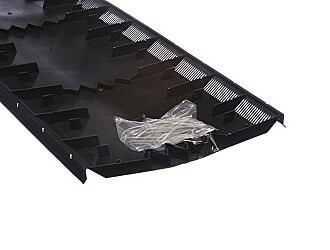 VenturiVent Plus provides 18 square inches of net free area per linear foot. Easy Installation. VenturiVent Plus has pre-printed slot guides for truss or ridge pole construction. Pre-drilled nailing holes are designed to assure proper nailing. The vent is pre-formed to a 4/12 pitch, and fits pitches from 3/12 to 16/12. Available with and without nails. VenturiVent Plus with nails has 30 3-inch ring shank, galvanized roofing nails bagged and taped to each 4-foot piece inside the carton. Installers will not have to hassle with removing nails that are snapped along the side of the vent prior to fastening. This shingle-over ridge vent is black and comes in 4 foot lengths.